OAKLAND, Calif. -- While it was Curt Schilling who could be found on a clubhouse sofa before last night's game reading the book, ``Feeding the Monster," it might have been more appropriate reading material for the kid pitching for the Oakland Athletics, the one just two years out of college whose second big-league start placed him at the mercy of Manny Ramírez and the Red Sox. The idea, according to informed Oakland watchers, was to showcase Jason Windsor, not to sacrifice him, but Ramírez and the Sox made fast work of the Cal-State Fullerton grad (Class of 2004), scoring four runs on nine hits in 2 2/3 innings en route to a 13-5 win that was sealed with a six-run uprising in the eighth. The Sox, who had a season-high 18 hits, sent 11 batters to the plate in the eighth, when Trot Nixon, who earlier ended his homerless streak at 123 at-bats, drew a bases-loaded walk from Brad Halsey to force home one run and Jason Varitek cleared the bases with a double to the wall in center. Nixon ran through DeMarlo Hale's stop sign to score, grabbing the plate with his hand before catcher Jason Kendall could apply the tag. The Sox added two more runs in the inning on singles by Mike Lowell and a fielder's choice. Oakland's frustration spilled over during the inning, as reliever Justin Duchscherer, lifted for Halsey after the walk to Ramírez, verbally accosted plate umpire Mark Wegner, signaling with his fingers that the umpire had missed at least two pitches. Duchscherer was ejected. Ramírez extended his hitting streak to a season-best 11 games with an RBI single in a two-run first inning, then hit his 28th home run of the season (and third in five games on this West Coast trip) in the third. He knocked in a third run with a sacrifice fly in the fourth. ``That was a weird game," manager Terry Francona said. ``We get up early, then it looks like we're going to have to hang on for dear life." Nixon would reach base four times -- he walked twice and was hit by a pitch by Scott Sauerbeck in the ninth (Sauerbeck left with a groin strain immediately afterward) -- and finished with three RBIs, on a first-inning sacrifice fly, his home run in the third ( immediately after Ramírez had taken Windsor deep), and on the bases-loaded walk in the eighth. Francona said that while Nixon was hitting just .213 against lefties and was 0 for 3 against Halsey, who had given up a home run to Wily Mo Peña last month in Boston, he elected to go with Nixon because Halsey had been having trouble with lefties. ``I think so, because [Nixon] was tired of answering questions about it," Francona said when asked if the homerless streak had been weighing on him. ``I'm not disappointed in the least. Tonight, the home run was a line drive, which is perfect. He doesn't have to lift, just hit the gaps." Although Schilling appeared to have an easy path to his 13th win, a day after teammate Josh Beckett became the first pitcher in the majors to post his 13th, the Athletics had other ideas. They scored three runs in the fifth off Schilling, who departed an inning later with a 6-4 lead, then turned up the heat against Sox reliever Manny Delcarmen in the seventh, when they cut the lead to a run. After giving up the back-to-back home runs to Ramirez and Nixon, Windsor struck out the next batter, Varitek, but was lifted for Kirk Saarloos after giving up singles to Lowell and Coco Crisp. Alex Gonzalez lined to left to end that threat, but the Sox added another run in the fourth on a walk, Mark Loretta's single, and Ramírez's sacrifice fly, and another in the fifth when Lowell doubled, advanced to third, and scored on Gonzalez's sacrifice fly, the third of the night for the Sox. 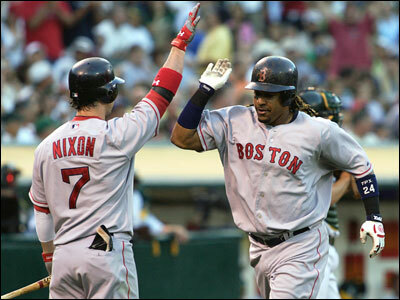 Nixon had delivered the Sox' second run in the first inning with a sac fly. But the Athletics, who had not faced Schilling here since 1990, when he was still a rebel without a cause for the Orioles, did their utmost to take their overmatched rookie off the hook. Kendall doubled to open the first, was bunted to third by Kotsay, and scored on Frank Thomas's sacrifice fly. Schilling breezed until the fifth, when he issued a one-out walk to Mark Ellis. Kendall singled to center, and when Kotsay lined a single, the Athletics had the bases loaded. Schilling induced Milton Bradley to tap out in front of the mound as one run scored, but Thomas lined a two-run single to right to make it 6-4. Schilling struck out Nick Swisher to end the inning, then went three-up-and-three-down in the sixth, but after 105 pitches, his work was done. But the Athletics strung together three straight hits against Delcarmen to open the seventh, singles by Ellis, Kendall and Kotsay producing a run and the 6-5 score. But Delcarmen retired Bradley on a fly ball to left, then struck out the next two hitters, Thomas on a big bender and Swisher on a fastball.